Professor Clare Collins (pictured) and Dr Megan Rollo are committed to finding nutrition research solutions to tackle Australia’s poor eating habits and the obesity epidemic, harnessing technology and the power of online platforms and the media to get the message out on a big scale. 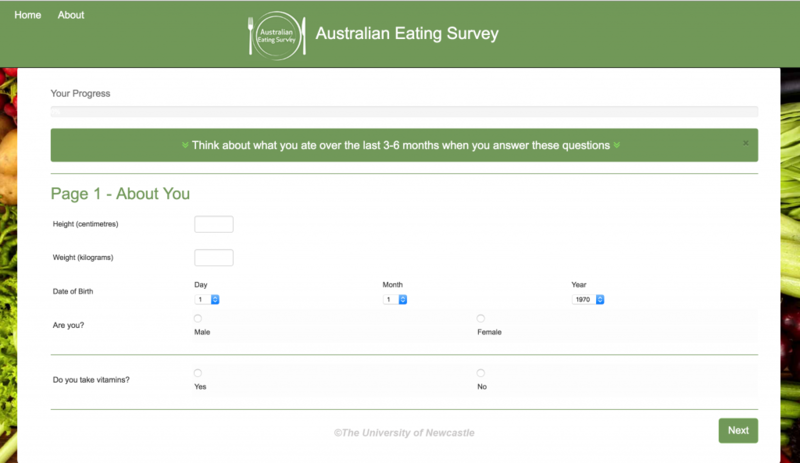 The Nutrition and Dietetics research team at the University of Newcastle developed the Australian Eating Survey™ (AES), a series of online food frequency questionnaires to help assess an individual’s usual food and nutrient intakes. Based on the results and recommendations, the personal nutrition report helps people to make good food choices. Initially developed as a paper-based survey, the AES has been redesigned as an easy-to-use online survey by Intersect Australia. The AES can be used by an individual to help assess dietary diversity and nutritional adequacy. It can also be used to bulk distribute questionnaires on a much larger scale, making it a useful tool for clinicians wanting to assess the food and nutrient intakes of their clients and patients, or for researchers assessing dietary intake in research participants online and across multiple locations. Within just months of the launch more than 7,000 surveys were ordered for clinical, research and individual use. 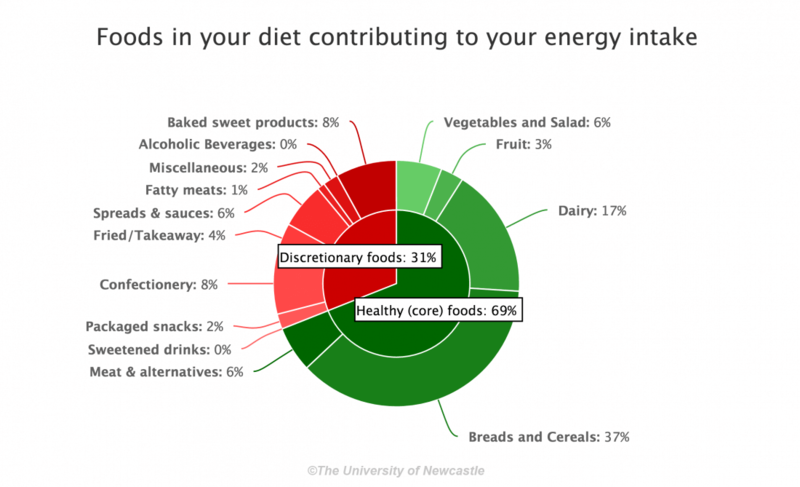 Professor Collins said: ‘This is very exciting news, people love digital storytelling and the visualisation of data about yourself helps you to interpret whether your eating habits are healthy or not. The personally tailored nutrition report helps people improve their food choice and nutrient intakes. It really revolutionises the way dietary analysis and feedback to individuals is done’. 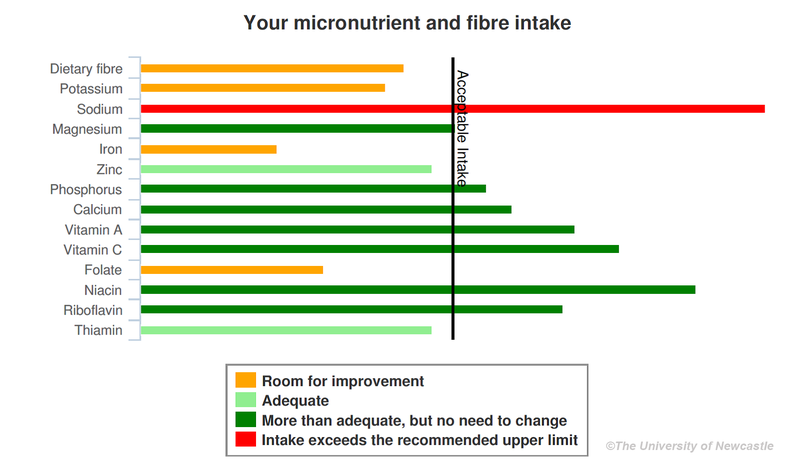 The report provides feedback on the food and nutrient composition of your usual eating habits, including energy, protein, fat, saturated fat, carbohydrate, alcohol, fibre and 13 vitamins and minerals (calcium, iron, magnesium, etc.). It also outlines aspects that match the Australian recommendations, and identifies foods that will help improve your nutrient intakes and eating habits. The AES takes only 15 minutes to complete and a personalised feedback report is emailed within minutes. You answer questions about the frequency with which you eat particular foods and drinks, and the AES then computes your results and compares them with Australian recommendations, tailored to your age, gender and life stage. A major benefit of the AES is the time saving it offers. For example, a traditional face-to-face consultation, where information on dietary intake is collected in person, usually requires two consults with the client. The first is to comprehensively assess dietary intake, then data is processed, analysed and used to populate a nutrition report that can be discussed in the second visit. Using the AES means clients can complete the survey using a computer or mobile device at any time before the consultation, or even while in the waiting room. The report can be accessed within minutes of the survey being completed. With the AES the client and clinician use the results in the first consultation to assist in developing a personalised medical nutrition therapy plan. Importantly, the AES can be set up so that the report goes straight back to the individual who completed it. This approach is suited for workplaces or occupational health and safety units wanting to provide staff with access to an online nutrition assessment with a personalised analysis and report. Professor Clare Collins is a professor of Nutrition and Dietetics at the University of Newcastle. She is Deputy Director of the Priority Research Centre in Physical Activity and Nutrition at the University of Newcastle, Director of Research in the School of Health Sciences in the Faculty of Health and Medicine and a Fellow of the Dietitians Association of Australia. Professor Collins’ research is in collaboration with the Hunter Medical Research Institute’s (HMRI) Cardiovascular Program, a partnership between the University of Newcastle, the Hunter New England Local Health District and the community. Dr Megan Rollo is a Postdoctoral Research Fellow in Nutrition and Dietetics at the University of Newcastle. She is interested in the development and validation of new methods for the assessment of dietary intake, in particular smartphone image-based records, and the design and evaluation of innovative uses of interactive technologies to enhance dietetic practice and help individuals make and sustain healthy behaviours in management of chronic diseases. 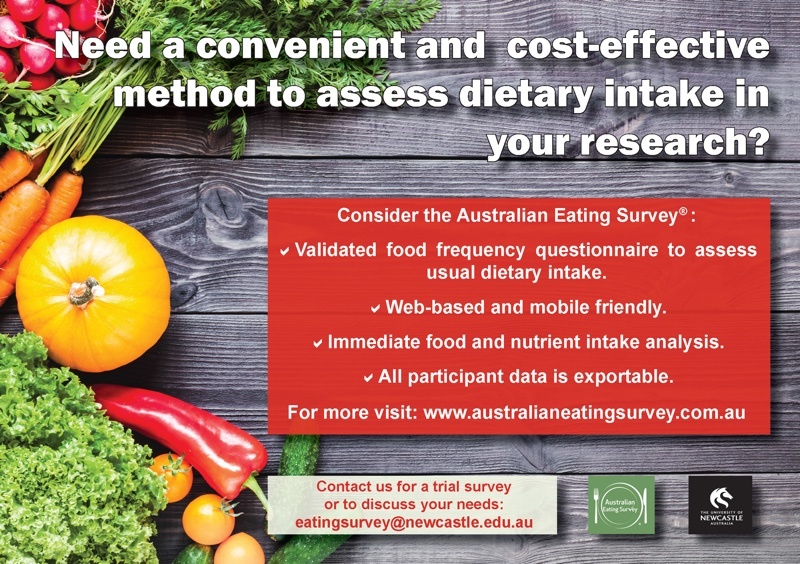 Please get in touch with eatingsurvey@newcastle.edu.au for more information or a trial survey.